Amazon is a huge player on the search market, with millions of people using the platform as their starting place for finding products. Studies have shown that more than half of U.S. shoppers start their product searches on Amazon. Buyers LOVE Amazon – and so do retailers. Its flexibility and scaling options make it an easy to use alternative to get exposure for their products. 1. What are Amazon Ads, compared to Google Shopping Ads? 2. How do Amazon Ads work compared to Google Shopping Ads? 2.2 Creative effort – how much work do Amazon Ads need, compared to Google Shopping Ads? 2.3 Ad Placement – where do Amazon Ads show up, compared to Google Shopping Campaigns? 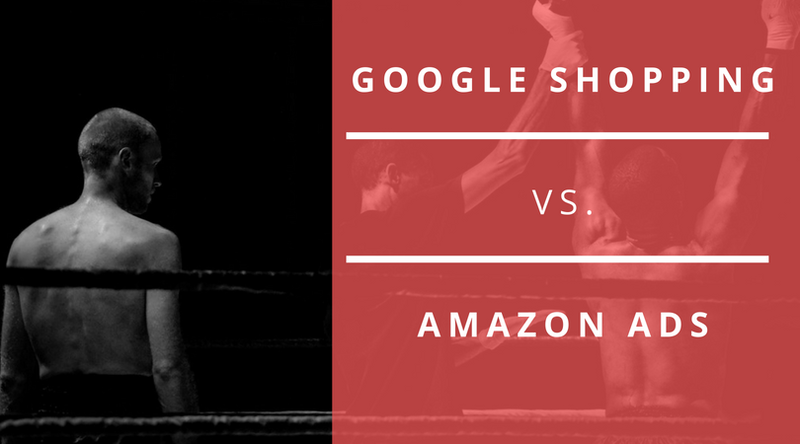 3. Who are Amazon Ads best for, compared to Google Shopping Ads? Amazon offers its own advertising platform to promote products and drive sales. Unlike Google Shopping campaigns, which are available to everyone, Amazon Sponsored Product Ads are addressed only to Amazon Vendors – first party sellers that sell their supply in bulk to Amazon and use the Vendor Central to manage their activities – and Amazon Sellers – third party sellers sell their inventory to Amazon customers through the platform and use the Seller Central. Besides Amazon Sponsored Product Ads, the platform does feature 2 other types of advertisements: Amazon Headline Search Ads and Amazon Product Display Ads. Ready to take your business to the next level? Schedule a free PPC marketing evaluation & learn powerful tips on how to expand your ecommerce marketing efforts! Amazon Headline Search Ads appear across the top of search results, above the Sponsored Product Ads. They’re also triggered by keywords and feature products one next to the others, allowing retailers to advertise 3 ASINs (Amazon Standard Identification Numbers) at the same time. They are available to both Amazon Vendors and Amazon Sellers. Not to be confused with Sponsored Ads, Amazon Product Ads (also called Product Display Ads) feature on product pages, below the Buy Box and “other sellers” section. They are also only available for vendors and can be either product-targeted or interest-based. Since we’re comparing Amazon Ads to Google Shopping Campaigns, in this chapter we’ll be referring to the Amazon Sponsored Product Ads, the most popular type used by sellers. How much Information do Amazon Ads require, compared to Google Shopping Ads? Just like Google Shopping Ads, Amazon Ads can display product photos, titles, description, shipping, star rating and price and, once clicked, take the user to a product listing, where people can shop. The difference is that, while Google Shopping ads take a user to the advertiser’s website, Amazon ads take the user to its own product detail page. The user never actually leaves Amazon. In my experience, most sellers prefer to make a sale on their own website versus on Amazon. Amazon is notorious for Buy Box issues – If you don’t have the best offer, you won’t be able to advertise your products. I’ll get into more on this later. On Amazon you don’t “own the customer” – Since you’re targeting users on a third party website, you can’t access any information about them, other than what Amazon provides you. That means no e-mail address or telephone number, which means no direct marketing to your Amazon customers’ inboxes or phones. On your website you don’t have to pay commission – Amazon’s fees include account fees of $0-$39.99 and referral fees which run about 15% of sales, but there are other costs to factor in as well. If there’s one big difference between Google Shopping Ads and Amazon Product Ads, it’s the Buy Box, a box on the Amazon product detail page, where customers can begin the purchasing process by adding items to their shopping carts. Basically, it’s Amazon’s way of choosing the best possible offer to feature. The Buy Box exists because of a key feature on Amazon: there are usually multiple businesses selling the same product. These sellers may compete for the Buy Box for that product. To decide which product to feature, Amazon will take into consideration a mix of factors in order to work out which of the sellers has the best offer. These factors include order volume, a competitive price (which doesn’t necessarily mean the lowest one), shipment and order defect rate and seller reputation. If you are winning the Buy Box users can just click on the item, add to cart and the order will automatically be sent to the seller which Amazon has selected as having the best offer. Users also have the option of clicking on browsing through other sellers instead of choosing the top one, but very few actually do. Businesses cannot run ads on products that don’t win the Amazon Buy Box. If they could, they would only be sending traffic to the competitor who’d actually won the Buy Box. In terms of actual effort on your part, Amazon Ads are similar to Google Shopping campaigns, in the sense that once your professional Amazon account is set up and you create your product listings, all you have to do is keep your products up to date. The ads will then feature information from the product detail page, such as images, price, availability and product rating. Just like Google Shopping campaigns, Amazon ads usually appear at the top, right side, and bottom of search result pages. Don’t be intimidated by the technical jargon: contact us today & we’ll help you improve your paid shopping campaigns on Amazon or Google! Amazon Ads use a cost-per-click, auction-based pricing model, based on keywords. There are 2 types of campaigns: Automated or Manual. Automated Campaigns are similar to Google Shopping Campaigns, as in Amazon decides which product to match to which search query. Manual Campaigns mean that you’ll actually have to decide which keywords trigger ads for which products. However, a relevant keyword is only half of the story. To win the Buy Box, you’ll have to put in some work into setting up and managing your Amazon account and products. Everything from product price, ratings, shipping costs, return percentage can determine if your ad is show or not. In terms of reporting, Amazon Product Ads can be tracked through Amazon’s platform, which generates a downloadable spreadsheet. The key metric for Amazon Product Ads is the Advertising Cost of Sales or ACOS, which indicates the profitability and efficiency of it’s ads. ACOS is the equivalent of ROI for Adwords, but it’s determined in the exact opposite way: media spend divided by revenue. The smaller the ACOS the better. In comparison, Googles Shopping Campaigns is more flexible and easier to use. They can generate more useful reports, which are easier to extract and with more features that help you track your marketing funnel with a rich set of data points. If your products are in high demand, chances are some share of 300 million Amazon customers have already been looking for your brand on Amazon. Building your Amazon business into a secondary channel, along with your own website, can be a great source of online orders. If you’re already a vendor or seller on Amazon, Amazon Sponsored Products give you the opportunity of having your products listed higher up, ahead of your competitors, with much higher visibility. At the same time, unlike Google Shopping, Amazon does charge a monthly subscription fee of $39.99 for your Professional selling plan, which is mandatory for Amazon Sponsored Products. That’s on top of the fact Amazon takes a percent of every sale, so you end up paying for traffic AND commissions. Another aspect you have to relinquish on Amazon is the ownership of the customer relationship. Each sale is viewed as a one-time transaction and, as a seller, you’re not able to re-market to these customers through notifications, by email, text or any other capabilities you might have set up for your own website. Not being able to contact the customer outside Amazon could result in lower customer LTV – lifetime value. There are those who speculate that some products do SO well that Amazon sometimes decides to engage directly with the supplier and end up selling the products themselves, so you might want to be weary of that aspect. So, is the sales commission cost plus the CPC costs for ads worth it? Sometimes it’s not about the efficiency of the ads, but the preference of the user, who’s already made up his mind. If you, as a seller, have order fulfillment on your own website, with higher shipping costs or a longer delivery time, it may be a better deal for the consumer to order directly from the Amazon platform. Especially with Amazon Prime offering free overnight shipping and other perks. Recent numbers indicate about 44% of U.S. households have Amazon Prime. I remember one of our clients who was in this exact situation. His Amazon ads were performing better than his Google Shopping campaigns. Upon further analysis, we realised that the reason was that there were more conversions from people searching for the brand on Amazon than on Google. We also noticed that our client was charging for shipping on their website, but offering it for free with orders placed on Amazon Prime. In the end, Amazon was the better deal for the customer.